Automatically retweet a specific Twitter user or list of Twitter users when they send a Tweet containing any of your defined hashtags, keywords, phrases, or emoji triggers. Automatically retweet any user your account is following when they send a Tweet containing any of your defined hashtags, keywords, phrases, or emoji triggers. Please note, we do not allow you to configure your account to retweet ALL tweets containing a certain hashtag or keyword from ANY twitter user on the Twitter platform. Doing so would eventually cause your account to retweet spam or inappropriate Tweets if you just indiscriminately retweet all users just because they included a specific hashtag. Instead, as mentioned above you do have the option to retweet Tweets from all the people your account is FOLLOWING. If you wish to test this use case, you will need to email us to enable this option on your account. If you wish to test out the automatic retweeting of a specific list of Twitter users, you can test that without emailing us. Just follow the steps below. Visit http://grouptweet.com/autoretweet/instructions/wizard. Here you will want to connect the Twitter account that you wish to be the one doing the retweeting. You are now on the “Retweet Accounts” menu of GroupTweet settings. In the example below, the @AutoRetweetDemo account wishes to auto Retweet both @Jack and @espn. You can add as many Twitter users as you wish. If you would like to have your Twitter account retweet anyone that your account is FOLLOWING, simply send us an email to have us enable this on your account. This way you don’t have to list each retweet account individually. After adding your Retweet Accounts, you need to navigate to the “Retweet Triggers” menu of GroupTweet settings so you can define which triggers you wish to prompt Retweets from your account. You can configure your GroupTweet settings to that your account publishes a Retweet anytime one of your Retweet accounts sends a Tweet containing a hashtag, keyword, phrase, emoji, or @mention of your account. Additionally, if you wish to use the old school “RT @user” format, then you can also convert incoming DM’s into Retweets. In the example below, you can see I’ve kept the Hashtag/Keyword trigger method enabled and added 5 triggers. This means that if any of my listed “Retweet Accounts” sends a Tweet containing any of these triggers, that Tweet will get Retweeted by my account. Most users simply use the hashtag or keyword triggers to prompt their Retweets. Additionally, you can also enable it so that your account retweets based on @mention or DM triggers. Additionally, you can configure your account to publish a Retweet anytime anyone on Twitter sends a Tweet containing an @mention of your account. You need to email us to enable this option. 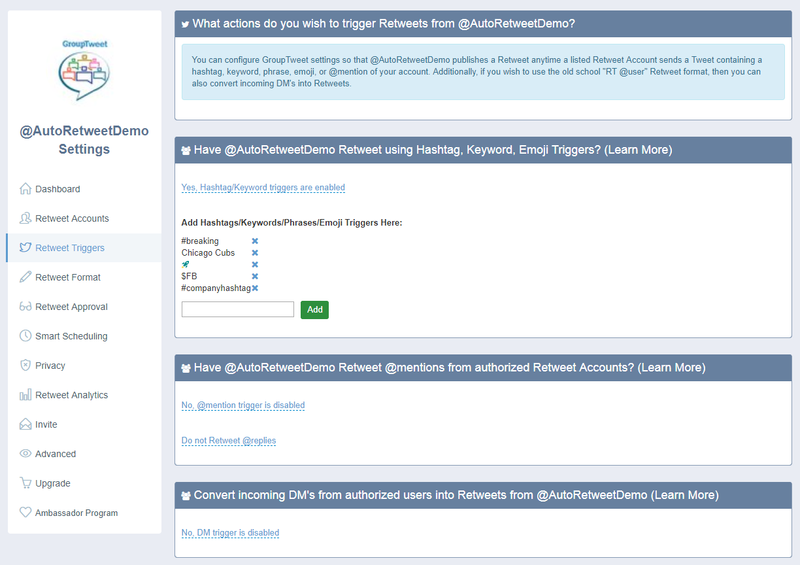 Want even more control of your auto Retweets? Enable GroupTweet’s Tweet approval functionality. If enabled, you will receive an email whenever a Retweet is about to be published. You can quickly and easily click the approve link right in your email if you wish for the Retweet to be published from your account. GroupTweet’s scheduling functionality allows you to limit the hours in which your account will publish retweets as well as set daily limits on the total amount of retweets published so that you won’t annoy your followers with too many retweets in a short period of time. GroupTweet’s custom Tweet formats allow you to customize exactly how your Tweets look. For example, instead of issuing a regular Twitter retweet, you can choose to republish the content’s of a contributors Tweet and append their username at the end. Something like “here is a tweet via @contributor”. Additionally, if you wish to keep the contributor’s names hidden, so that their Tweets look like normal Tweets from your account, you can choose the GroupTweet Tweet Format that is labeled “message only”. 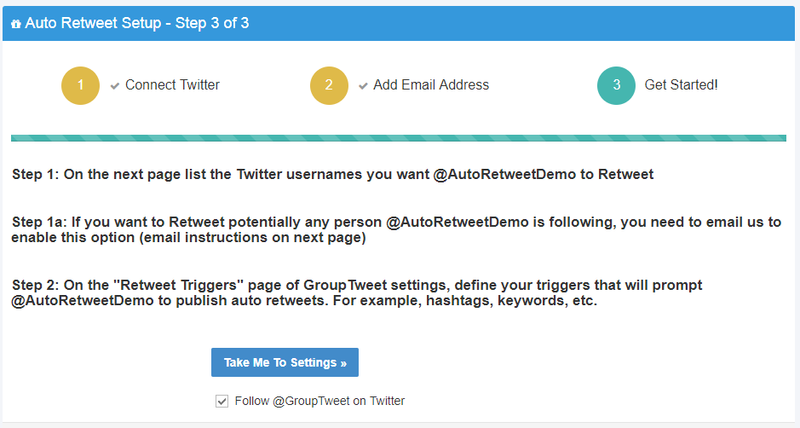 Configure Custom Tweet formats under the “Retweet Format” menu of GroupTweet settings. As always – if you need any help or guidance just email ryan@grouptweet.com. GroupTweet can be used and configured in a number of ways, so if you have a unique use case or requirement chances are we can help. Just let us know what you are trying to accomplish, and we can let you know if GroupTweet can help you out. If not, we can recommend a different Twitter tool that will do the job. How quickly are retweets processed? GroupTweet processes retweets instantly! If you want retweets to be delayed or only sent during certain hours, you can easily configure this under GroupTweet scheduling settings. There are no set GroupTweet limits. Twitter enforces their own limits as you can see here. Does it break any rules? Any accounts that perform aggressive or very high volume Retweeting with GroupTweet will have their auto retweet service paused. GroupTweet’s auto Retweet pricing can be found here: https://GroupTweet.com/autoretweet/pricing. Prices range from $9.99/month to $24.99/month for an unlimited account. My use case is slightly different. I’m not sure if GroupTweet can accomplish what I’m looking for? No problem! Just send me an email, ryan@grouptweet.com, and I can help you out. For example, if you want to facilitate auto retweets from multiple accounts, then I can help you with that. Alternatively, you can visit GroupTweet.com/autoretweet and start an instant chat request (lower right hand corner) during normal business hours. Or schedule a time to chat on the phone as well here. © 2019 GroupTweet Blog — All Rights Reserved.